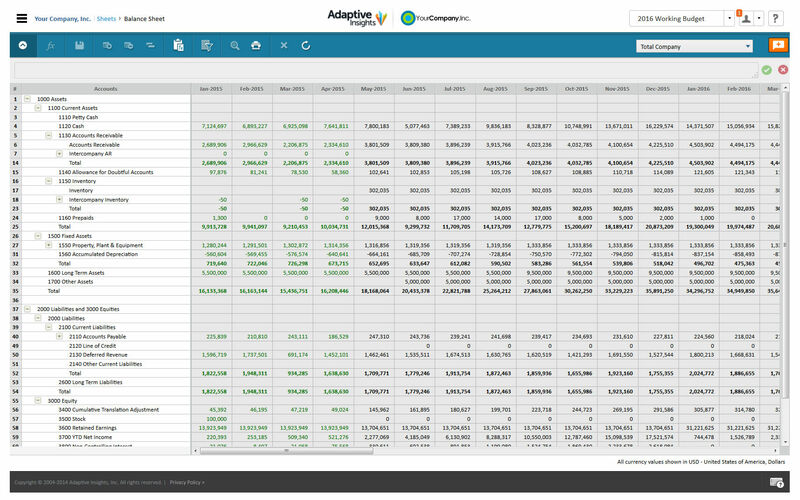 Adaptive Insights is well suited for many business sizes, including small companies to companies with billions of dollars in revenue. Its flexibility with customization and the various options is very attractive. One of the main strengths of Informatica Enterprise Data Integration is its performance. If your business requirements include processing of huge volumes of data, then Informatica is strongly recommended over other tools. I would recommend Informatica over Talend.On the other hand, if your business primarily works on Apple machines, Informatica Enterprise Data Integration is a resounding NO. Running Informatica on a VM or a Remote Desktop completely kills its efficiency. Adaptive Insights has so many good resources and easy filtering capabilities with active searching. When you go to a section of Adaptive Insights, you will see filters at the top of the page. As you change them, the contents of the page change to suit what you're looking for. This makes it easy to find the resources you need! As previously mentioned, the FP&A Glossary is a great feature due to its concise definition of many common terms in FP&A. I have not had much experience with the eBooks section of Adaptive Insights, but there are is a wide variety of topics to explore, such as rolling forecasts, and best practices for controllers. Informatica has a wide range of support for databases. Pretty much every mainstream DBMS is compatible here. Designing ETL mappings and workflows is a very intuitive process, and takes minimal learning time and effort even for a beginner. Informatica's biggest strength is its sheer performance. It is unmatched in terms of handling large volumes of data. Setting up Informatica and integrating with your existing services can be a hassle. While the support team is quite helpful, it can still take a considerable amount of time and effort to get Informatica up and running. Informatica Enterprise Data Integration unavailable for MacOS. This can be a huge problem for a business that primarily uses Apple machines. Using Informatica PowerCenter for ETL designing can be quite intuitive for basic to moderately complex workflows. However, for achieving advanced tasks, there is not sufficient documentation available. Availability of options to integrate with application oriented databases like SAP, Salesforce etc.Product Support.Reliability. Positives;- Multi User Development Environment- Speed of transformation- Seamless integration between other Informatica products.Negatives;- There should be less windows to maintain developers' focus while using. You probably need 2 big monitors when you start development with Informatica Power Center.- Oracle Analytical functions should be natively used.- E-LT support as well as ETL support. Positives;- Multi-user development environment.- The speed of transformation.- Seamless integration with other Informatica products.Negatives;- There should be fewer windows, to maintain developers' focus while using. You probably need two big monitors when you start development with Informatica Power Center.- Oracle Analytical functions should be natively used.- E-LT support as well as ETL support. Our implementation was non eventful and we were very satisfied with the overall experience. I was not involved in the selection process, but have interfaced with TM1 to our parent company. My personal experience has found Adaptive to have greater responsiveness. Informatica Power Center was already selected by my company before me. I just learned the software and started using it.